What is Smart Money? Smart Money is an electronic wallet here in the Philippines that you can use to transfer and receive money to/from another Smart Money user using your mobile phone with Smart or Talk 'n' Text sim card. It can also be used to receive money from selected country outside the Philippines to your Smart Money account. Your monthly utility bills can also be paid using your Smart Money, like electric bills, phone bills, water bills, and many more. Lastly, your Smart Money account comes with a Smart Money MasterCard, an ATM debit card that you can use to withdraw your Smart Money funds on BDO, BancNet, Megalink or ExpressNet ATMs in the Philippines; you can also use SMART Money in Cirrus ATMs outside the country. 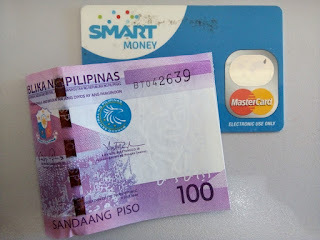 One of the reason I applied for Smart Money is to use it for online purchasing or shopping. Online shopping is sometimes frightening, specially if you’re in a publicly used wifi. With Smart Money MasterCard, your online purchase is secured. An SMS is sent to your mobile phone every time you make a successful transaction and it has a lock/unlock feature for Internet transactions. Before making a purchase online, you have to unlock it using your mobile phone and it will ask for a pin code before you can unlock it. Unlocking has Php2.50 fee deducted to your airtime load but locking is free. Your card will be unlocked for 30 minutes, will automatically be locked after that, and maximum of 2 transactions only while it is unlocked. Smart Money is an electronic wallet and prepaid, so the only money in it is the only amount that you need to buy the item. Reloading your Smart Money over the counter is free of charge, but sending, fees apply. You can reload your Smart Money thru Smart Centers/Stores, Banco De Oro Banks, or Smart Padala authorized stores nationwide. How to apply for Smart Money? to apply hassle free, just apply online first; with in a day or 3 days a customer service representative from Smart will call you to confirm all the information that you put on your application form are correct – make sure that you’ve memorized your Account number that was sent to you during activation of smart money or have a copy with you all the time because it will be asked to you. After the call, an SMS will be sent to your mobile phone within 7 days, that you may now pick up your ATM MasterCard at your preferred Smart store that you put on your application form during sign up. The card is delivered to your pick up store in 3 working days, and 5 working days for provinces. After your card is received, call the number indicated on the sticker in the card to activate your card and wait again for 1 working days for your card to get activated, no SMS will be sent, just try and try if it’s already working. For more details, and updated instructions, just click on the links in the article. Smart money MasterCard can be used to verify your Paypal account.